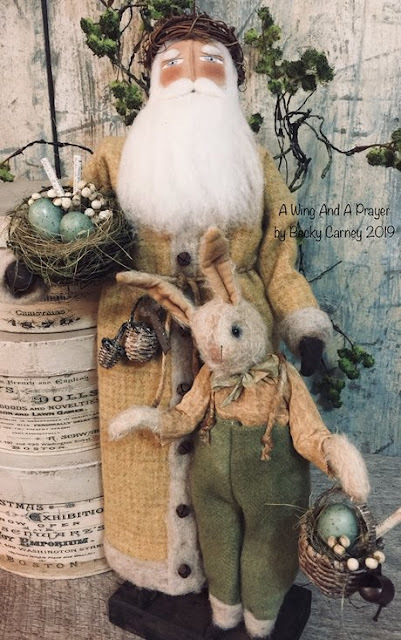 Photos do no justice to this Spring Time duo… Olde Spring Blessings Santa & Tinker are mounted on a Primitive wood base. Santa has hand painted blue eyes, a stitched sculpted nose and blushed cheeks. His beard is made of a off white wool roving and a grapevine wreath sits atop his head. His arms are wired for gentle posing and he has painted on gloves and boots. Santa is dressed in a Mustard Plaid Felted Wool coat and pants all trimmed with rusty bells, needle felted wool roving, and a rope belt. He hold a grapevine Nest in one hand filled with blue/green eggs, tallow berries, paper scrolls and sisal straw. Two grungy baskets and an old rusty key hang from his belt. $259.00 with Free Shipping to the Continental US SOLD! 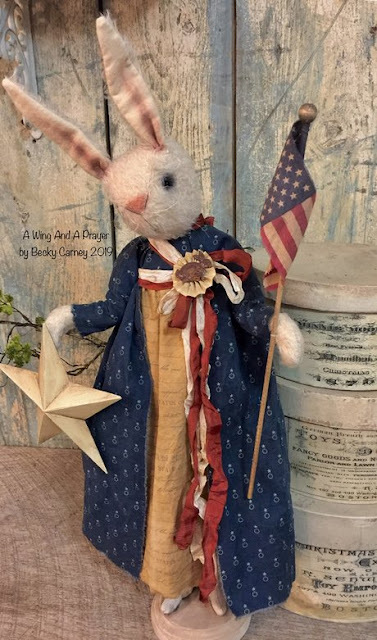 Sweet Liberty is a darling Americana Bunny, mounted on a grungy white base. 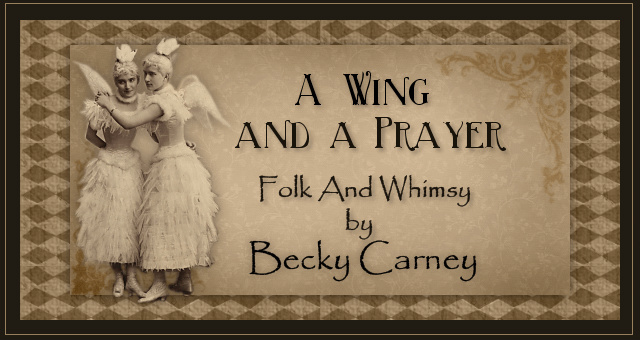 She is made of Mohair and muslin, with hand stitched facial features and glass bead eyes. Her head, ears and arms are wired for gentle posing. She is dressed in a Colonial Blue and mustard underskirt dress, adorned with Red and Cream color seam binding Ribbon. Other details include a grungy old flag, and great big grungy metal Star and a paper pinwheel and rusty rabbit adornment… A Sweet Patriot. "Sweet Liberty" measures nearly 22” Tall. $195.00 with Free Shipping to the Continental US. SOLD!